Our first evening on PEI we found ourselves at the Charlottetown harbor, where we decided to have dinner at Lobster on the Warf. We realized we hadn’t eaten since the airport at 2 or 3am our time. We were still running on 5 Timbits and a banana. 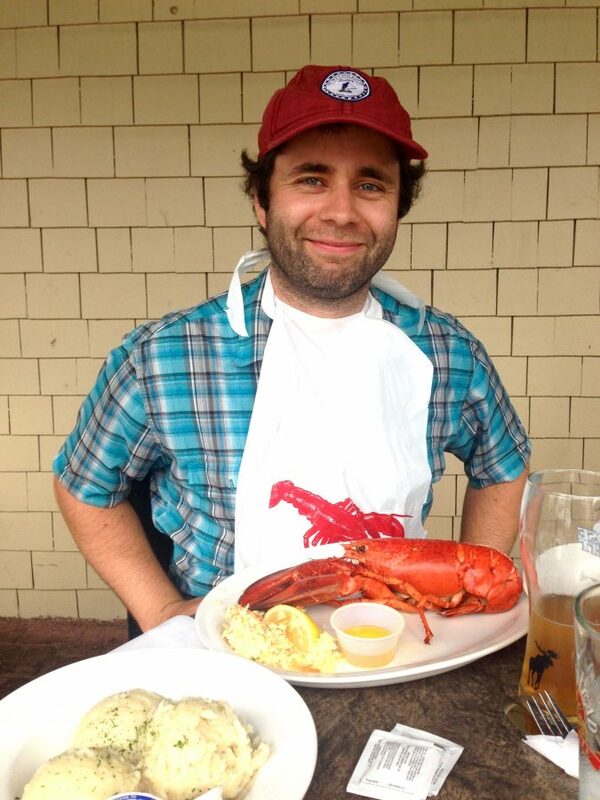 It was the promise of eating lobster that had convinced Micah to join me on this trip, so this restaurant sounded like the right place to start. Micah ordered the lobster roll while I got the steamed tail. This was my first time trying lobster, so I can’t say for sure, but I think it was a little over done. However, we were hungry and both dinners were gone in a matter of minutes. 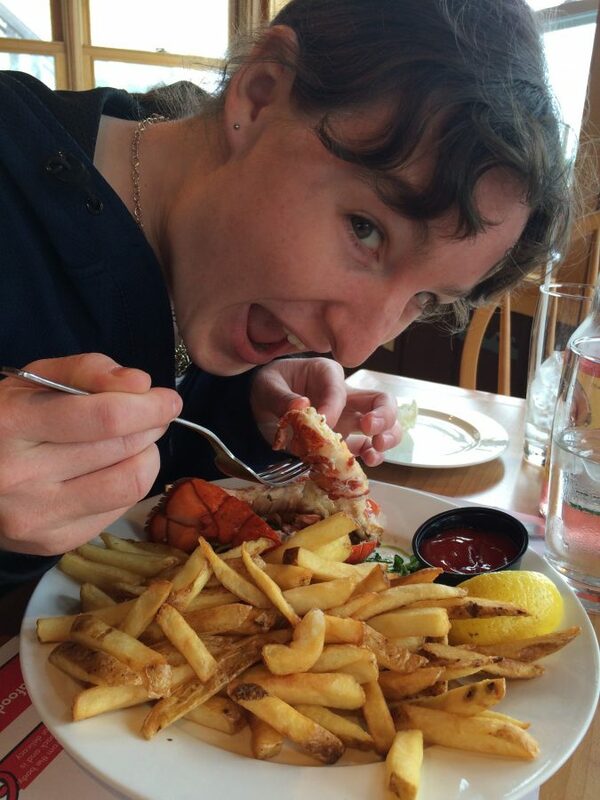 Not only was this my first lobster, but I also ordered my first official Anne of Green Gables Raspberry Cordial! It turned out to be nothing more than raspberry soda in a glass bottle labeled with Anne’s face, but I was supremely happy about it. My first time trying lobster! After dinner we visited the Cow’s ice cream shop. 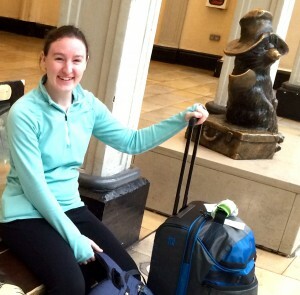 We would both have many more lobsters, cordials, and Cow’s ice creams before the trip was over. 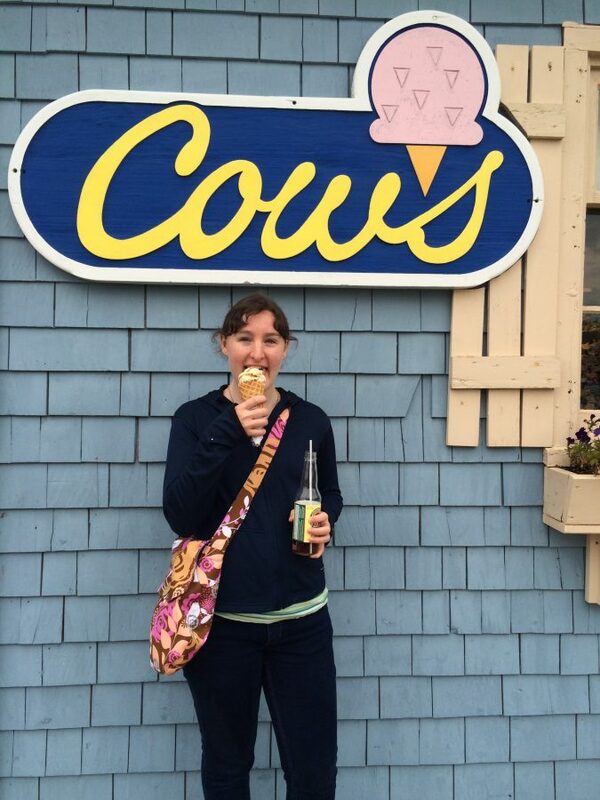 Cows is THE iconic ice cream place of the Island. They make 30+ hand-mixed flavors. I had apple crisp flavor one day. It was delicious. (Though honestly, I think Dorset’s honey comb ice cream was better!) Micah had a blueberry. Then there was the triple chocolate thing I couldn’t even finish! There is one large factory/shop and several smaller ice cream parlors throughout the island. 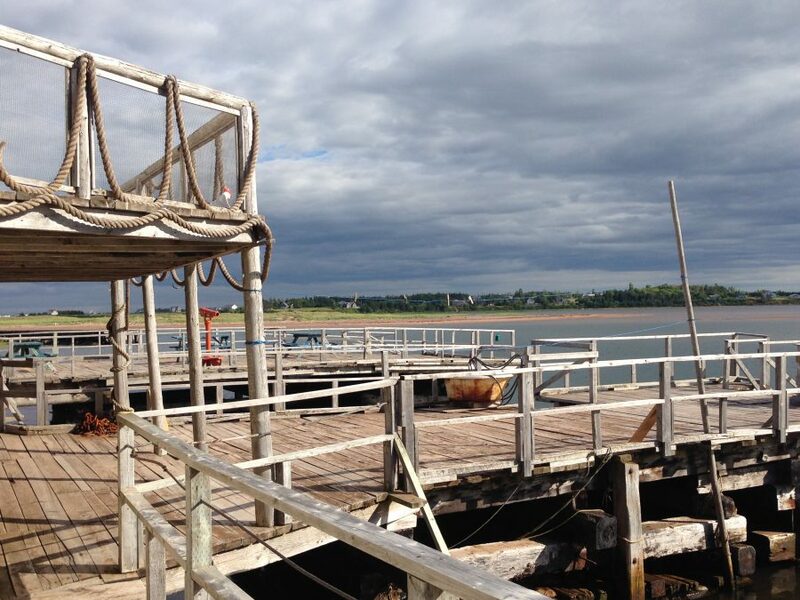 There’s a small one on the waterfront in Charlottetown and one in Avonlea Village. We happened upon the Cows Factory Tour while driving around Cavendish. Cows, it turns out, is not just known for its delicious ice cream, but also for their funny shirts. There wasn’t much to the tour. There were windows into the shirt printing room, the ice cream room, and the cheese storage. Most of the building was actually the gift shop. I had read that this was a tourist attraction to be visited. I would say the “tour”, the t-shirt gift shop, and the ice cream all together made the stop worth it. 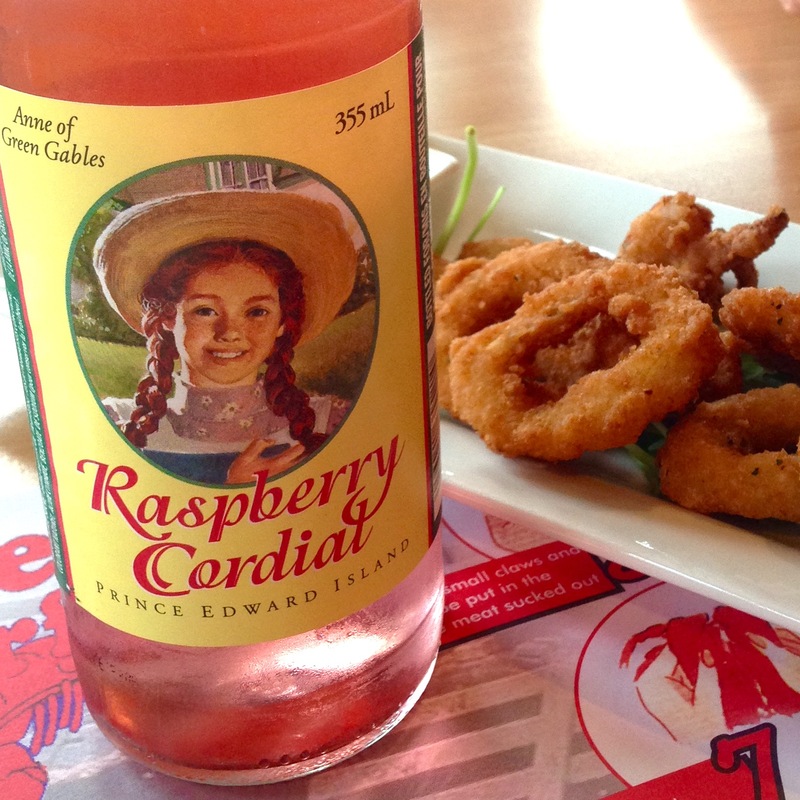 Cows is also the producer of the official Anne of Green Gables Raspberry Cordial, which can be found all over the island. One evening we discovered that unless you eat early, finding a restaurant with an open table around dinner time during tourist season is difficult. The first place we attempted to eat at, the line just to get in the front door was so long we probably would have been there through the night. The next place offered us a table, if we felt like waiting for hours. 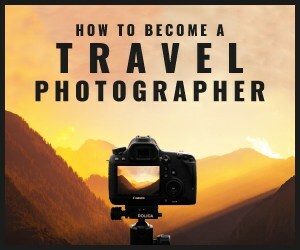 By this time we were discouraged and hungry so I grudgingly opened the tourism magazine I had snagged at the airport hoping the restaurants it suggested were a) close, and b) not overly touristy. What I found was an article about award winning chef Emily Wells who is currently flexing her culinary skills at The Mill in New Glasgow. Lucky for us, that was just down the road from our B&B! We had driven past it on our way out. We should have started there! Feeling on the verge of tears type hunger, and feeling bedraggled from the long day, we couldn’t believe it when we were offered a table right away! I was suddenly very aware that I was perhaps under-dressed for a dinner in such a place as this, but they graciously served us anyway! While dining at The Mill the previous evening, our view had been of a delightful rambling river. On the other side, above what looked to be a nice paved walkway running alongside the river, we had seen a large yellow building that appeared to have dinners as well. Upon questioning our waiter, we learned this was the back of the PEI Preserve Company and Restaurant. Since the Anne of Green Gables tea had been a bust (Read about that here), we decided to go to the Preserve Co. for gifts of jam and tea to take home to family…though it was questionable whether we’d finish them off before we got them to family… I picked out a delicious sounding Black Current jam while Micah picked out the strangely flavored Cabernet Sauvignon Wine Jelly. There were so many strange and yet tantalizing sounding tea flavors that it was hard to decide. I finally picked out a Rose blend. View of the back of The Mill from The Preserve Co.
Micah randomly picked a direction and we found ourselves in North Rustico. This is a small, old fishing village by its looks. The buildings are weather beaten with peeling paint. Half of the structures look dilapidated. It has a sort of rustic fishing village beauty to it. The dock railings are looped with rope and look straight out of a pirate movie. North Rustico also contains the one restaurant everybody on the island kept recommending, the Blue Muscle Café. The seating for this little café & bar is on a pier and only half the tables have a partial roof, or maybe more of just a cover. The restaurant is always full and impossible to get into without a long wait. We had tried to have dinner here once before and given up, so we returned in an attempt for lunch. As the seating is mostly open air and the wind was blowing, I was rather chilly. Looking around, it seemed that people around us had brought warm jackets. At least one couple had blankets wrapped around their shoulders. The locals must know that jackets are necessary, but the food is worth it. As part of the Kindred Spirits Inn package I had purchased we were promised a chowder dinner. 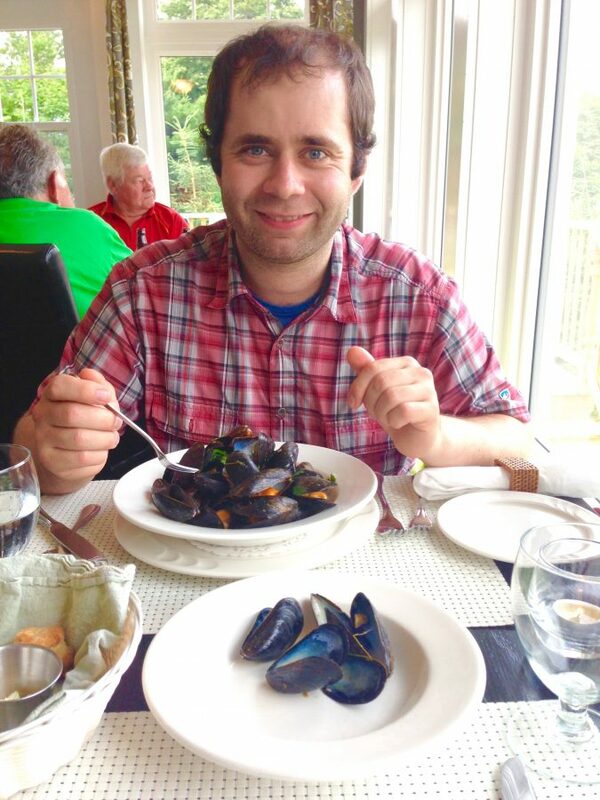 We didn’t know until we checked in that the Inn simply provided us with vouchers for a dinner at -none other than- the Blue Mussel Cafe. Luckily by this point in the trip we already knew that we wouldn’t get in unless we went early for dinner. Despite our early arrival, we still had a half hour to wait! We, and the rest of the waiting dinners, killed time by poking around the souvenir shop in the cove while waiting for our buzzer to go off. 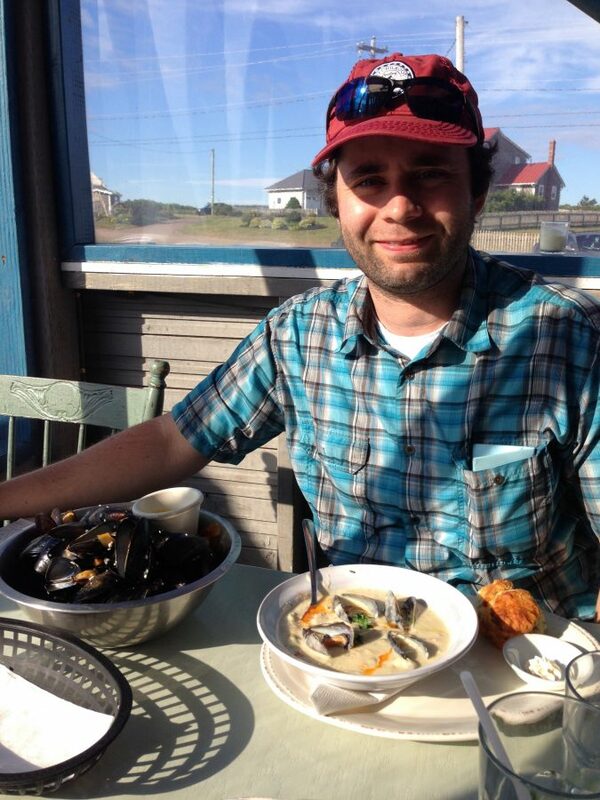 When our turn finally came, Micah ordered the chowder, and his 3rd heaping bowl of PEI mussels. I exchanged my chowder for a lobster mac & cheese. Dinner was delicious. As was dessert. And this time we were seated at one of the more protected tables from the elements, so we enjoyed our dinner in comfort. As we pushed our empty dinner plates away from us, the owner came over and chatted with us and ultimately convinced us to try the desserts! (No matter how full you are, there is always room for dessert.) We learned that he had opened the joint 3-4 years before and it had since then become a hit. We were also able to learn all about PEI’s food exports and production as well as gain insight into the local community mentality. I had asked about the potatoes I had had at lunch because they tasted unlike any potatoes I recognized. He told us that PEI’s potatoes have a distinct earthy taste thanks to the extreme iron content of the soil (as is evidenced by the red dirt and sand). The potato is also the largest cash crop exported from the Island. Interestingly, there is one guy on the island who collects all the potatoes and distributes them to the restaurants. PEI also farms mussels, oysters, and hay. They are big on lobster too, which I’d had my share of by this point. He told us he has a lobster guy near the restaurant who has holding tanks where the sea water from the bay flows through the tanks. Discussing the Island’s current day farming reminded me that I had been wondering since reading a display board at Green Gables about the PEI farming community of the 1800’s, whether the mentality of “many hands make little work” was still prevalent today. In Montgomery’s time, the farmers would help one another out with harvesting and other tasks that had to be done quickly at certain times of the year. PEI has a short growing season and it took many hands, often more than one farm alone had, to tend to all that needed doing. With so much still similar to the 1800’s on PEI, but with newer, faster technology available, I wondered if the mentality had shifted at all. The Cafe owner thought the mentality is still much the same. For example, he told us, if somebody needs a fence put up, or another restaurant runs out of lobster, neighbors are more than willing to help out. Several times during our trip we were told that not much, besides cars, paved roads, and cell phones, has changed in PEI since the 1800’s. I think it’s nice. I mean, who goes to Canada and doesn’t get Timbits? I think I had lobster almost every night of our week long vacation. Have you had the pleasure of dining on PEI? Where are your favorite locations for dining on fresh locally produced/harvested food and what type of food is it? Let’s discuss in the comments below! 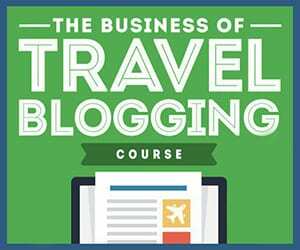 #WorldBookDay 2016: Where will books take you? 1) You wrote: “because they tasted unlike any potatoes I recognized”. They tasted better? How the potatoes were served? Baked, fried or some other way? 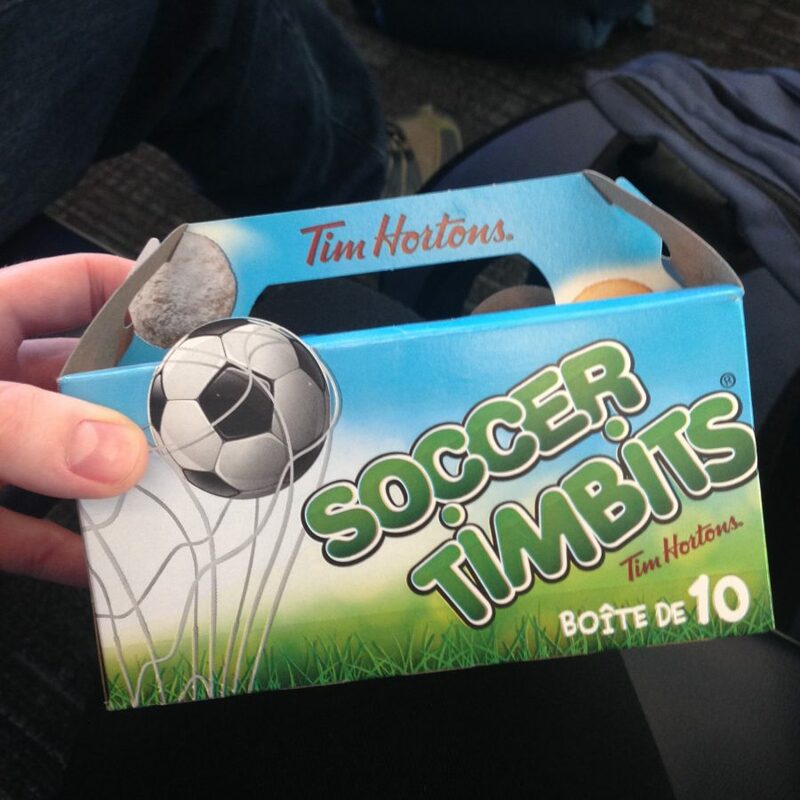 2) What are the “Soccer Timbits” . The potatoes were served like fries with my fish but they were very earthy tasting. The Timbits are doughnut holes.